To Cite: Kiani A, Zaidi S M A , Heydari M. Orogastric Feeding: Two Reports from Medieval Persia and Spain (9th - 12th CE), Iran Red Crescent Med J. Online ahead of Print ; 21(1):e88925. doi: 10.5812/ircmj.88925. Although enteral feeding and nutritional delivery by enema are well known to exist since ancient times, the old history of gastric feeding is less investigated. Most reports of the history of gastric feeding mention Capivacceus as the first one who reported the use of orogastric feeding in 1598 (1, 2). However, our recent investigation shows that there are at least two reports of orogastric feeding in the 9th and 12th centuries from medieval Persia and Spain. “In rabies, since the patient escapes from the water and does not drink water, a reed with empty duct can be entered from the patient’s throat to the stomach head; then the head of this reed can be filled with water” (6). Figure 1. 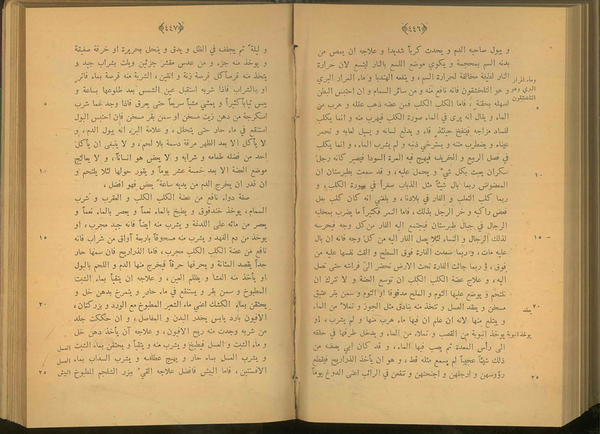 The chapter of “on the symptoms and treatment of poisoning” from Ferdous al-Hekma fi al-Tib (Paradise of Wisdom in Medicine) by Ali ibn Sahl Rabban al-Tabari (838 - 870 CE), kept in Iran Parliament Library, record number: 12 - 7464. (Link: http://dlib.ical.ir). “…..So the patient cannot eat any drug to cure, or any food to nourish him. If the patient is not treated, he will die from cachexia and weakness and there is no way except to feed him in another way. In this way, a golden or tinny tube is entered into the patient’s throat and pushed forward slowly. One side of the tube should be wide allowing being hold by the physician. It causes nausea in the patient while entering the esophagus; so, enter a little amount first; then pull it out and advance again when the patient gets adapted. It is followed by infusing milk or other suitable liquids to feed the patient until the cause of the main disease is cured”. These reports show that orogastric feeding has at least a six hundred years older history than what was previously assumed. It seems that investigating Muslim medical manuscripts can provide us with accurate information on the human gradual achievements in the field of medicine through history. 1. Harkness L. The history of enteral nutrition therapy: From raw eggs and nasal tubes to purified amino acids and early postoperative jejunal delivery. J Am Diet Assoc. 2002;102(3):399-404. doi: 10.1016/S0002-8223(02)90092-1. [PubMed: 11902373]. 2. Paine JR. The history of the invention and development of the stomach and duodenal tubes. Ann Intern Med. 1934;8(6):752. doi: 10.7326/0003-4819-8-6-752. 3. Ardalan M, Khodadoust K, Mostafidi E. A Review of Ferdous al-Hekma fil-Tibb by Ali ibn Raban Tabari. J Med Ethics Hist Med. 2015;8:7. [PubMed: 27350863]. [PubMed Central: PMC4920980]. 4. Azmi AS, Mohamed Nor Z, Mohd Sobali A, Ismail MY, Abdul Halim A. From christianity to Islam: An analysis of Ibn Rabban’s approach towards Sira Nabawiyya. Int J Islamic Thought. 2017;11(1):1-5. doi: 10.24035/ijit.11.2017.001. 5. Kiani H. [Ferdous al-Hekma fi al-Teb one of the first medical documents in islamic civilization]. J Res Hist Med. 2013;2(3). Arabic. 6. Rabben Tabari. Al-Sadighi MZ, editor. [Ferdous al-Hekma fi al-Teb]. Berlin: Matba' Aftab; 1982. Arabic. 7. Ibn Zuhr. Al-Khoury M, editor. Kitab al-Taysir fi Al-mudawat Wal-Tadbir. Damascus: Dar al-Fiker; 1983. p. 153-4. 8. Azar HA, McVaugh MR, Shatzmiller J. Ibn Zuhr (Avenzoar)'s description of verrucous malignancy of the colon (with an English translation from Arabic and notes on its Hebrew and Latin versions). Can Bull Med Hist. 2002;19(2):431-40. doi: 10.3138/cbmh.19.2.431. [PubMed: 12776717]. 9. Karamanou M, Tsoucalas G, Saridaki Z, Iavazzo C, Androutsos G. Avenzoar's (1091-1162) clinical description of cancer. J BUON. 2015;20(4):1171-4. [PubMed: 26416074].